Buckcherry have announced a series of changes to band’s lineup. The California rockers have parted ways with co-founder/guitarist Keith Nelson and longtime drummer Xavier Muriel, and shared the announcement alongside an update on a side project by lead singer Josh Todd and guitarist Stevie D.
“To our amazing and loyal Buckcherry fans!,” writes Stevie. “As most of you may already know, Josh and I have just completed the debut album from our other band, Josh Todd & The Conflict, which is set to drop in September. We look forward to seeing all of you on the road very soon - keep your eyes peeled for upcoming dates, we'll be adding them shortly. “And, as most of you may already also know, Buckcherry has recently gone through some big changes. As we wish the very best for Keith and Xavier in all of their future endeavors, we want you to be the first to know that we'll be showing up in a huge way for all the BC dates this summer with the help of a couple of our dearest friends, Kevin Roentgen and Sean Winchester. The new lineup debuted at Las Vegas’ Rock Into Spring on April 28; the band have a few concert dates scheduled so far this spring, including an appearance at the Bud Light River City Rockfest in San Antonio, TX on May 27. 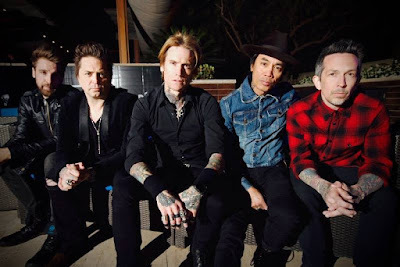 Buckcherry’s most recent studio release is 2015’s “Rock N’ Roll.” The group issued an expanded, Deluxe Edition of their seventh album in January of 2016.